LCpl. Smitty welcoming our guests to the luncheon. Nope, we don’t. With the number of combat casualties down this year the luncheons have become smaller. We’re serving more non-combat patients than we are combat patients. When Dina asked how many to plan for I gave her smaller number than we’ve ever taken food for, based on the last few luncheons and they ended up serving almost three times that number. Okay, so we’re always worried we’re going to run out… She tells me they had very little in the way of leftovers. June 7, 2015 – 4th Floor: Can DO and Git ‘er Done! Guy dropped off the supply boxes the day after the luncheon. 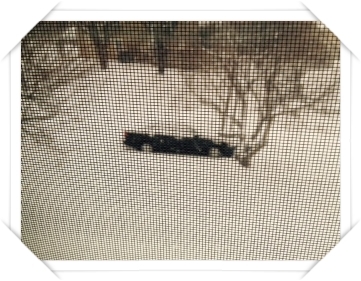 We unloaded the tubs and bags from his truck into the living room, then he told me how things went at the hospital. Thank you! Job WELL done!!! April 19, 2015 – 4th Floor: It’s Spring! Spring has sprung! 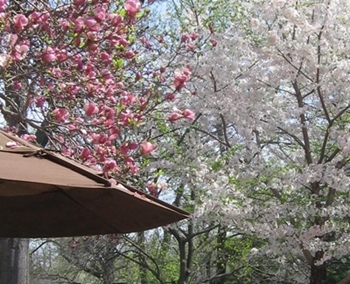 April 2013, Mercy Hall patio. Way-uhl, we forgot to take pictures so here’s one from 2013 taken at a Mercy Hall luncheon. March 22, 2015 – 4th Floor: It’s quiet on the ward! Yep, things are quiet on the ward these days. This is good. After taking a break, our 2015 luncheons have begun! 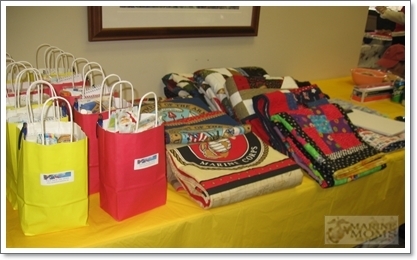 We had quilts from Bayside Quilters and Katie made up snack bags to give out to our guests. Earlier in the week Gladys, Bob and I met up to give them the supply boxes. They were ready to roll! We were keeping our fingers crossed the snow and ice that came in on Saturday would melt before they headed out Sunday morning. Thankfully, Gladys and Bob’s street was plowed and the roads in Katie’s neck of the woods were clear by the time they were ready to leave. The Warrior Family Coordination Cell for helping us coordinate the event. The Marine Corps Wounded Warrior Regiment-East at Walter Reed for their advice and help. Preventative Med for ensuring the safety of our service members through good food practice policies. 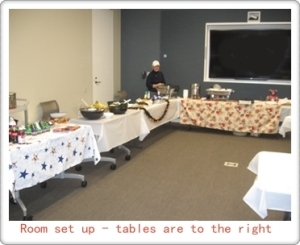 The USO at Walter Reed for the use of their room and kitchen, and to their volunteers for assistance. Our “Elfs”, many of whom who have been doing “Elfie” stuff with us since 2007, helping to make the event so special! Our MM-B Volunteers, who pull everything together to make the luncheon a success! Our Nation’s service members and Veterans who’ve put their lives on the line defending our country. 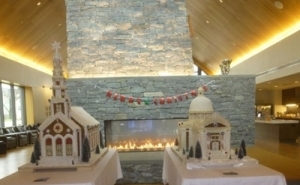 Gingerbread houses in front of the welcoming fireplace at the Walter Reed USO. Photo courtesy of Gladys. A room at the USO at Walter Reed. 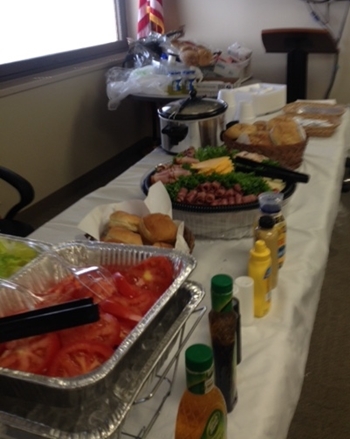 Today’s Luncheon was a celebration of the USMC’s 239th Birthday and Veterans Day, serving a Thanksgiving Day meal! The room when we arrived, the “stuff” we brought (first trip up), and almost ready to serve. The buffet, missing are the mashed potatoes and stuffing. October 23, 2014 – Good people doing good things. There are a heck of a lot of nice people doing good things for our service members at Walter Reed. Mercy Hall has closed. The residents moved over to Sanctuary Hall, the new barracks, in the early summer, and food events aren’t allowed there. Base policy. 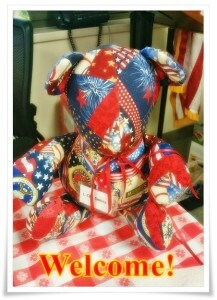 Today was our first luncheon at the USO Warrior and Family Center. We reserved a room in the new USO for today’s luncheon. Their volunteers were very helpful, checking in with us every so often to see if we needed anything. They stayed busy greeting people as they entered the building, making them feel at home, keeping the snack bar stocked for the guys and gals coming in, and a multitude of other things. 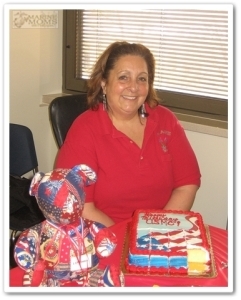 Bringing "Comforts of Home" to Bethesda (now Walter Reed NMMC) since 2005. Happy Birthday, United State Marine Corps! 243 Years! Posts by month and year. This will take you to Tributes written over the years. and TTY for hearing impaired. 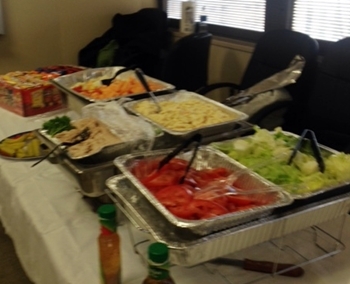 families, ALL service branches, on the surgical ward at Walter Reed NMMC in Bethesda, MD providing luncheons and support and encouragement to the patients and their families. 100% of funds donated toward our mission directly benefit those we serve. 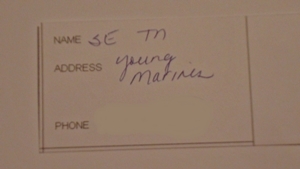 Southeast Area Tennessee Young Marines! Congratulations! 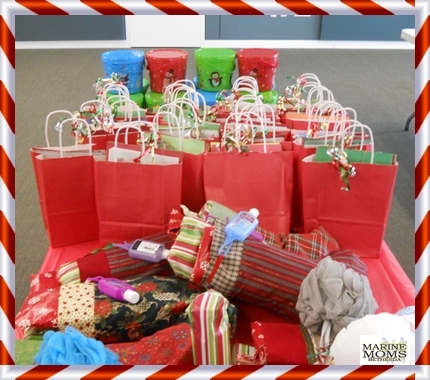 Thank you to everyone who participated in this year's raffle! 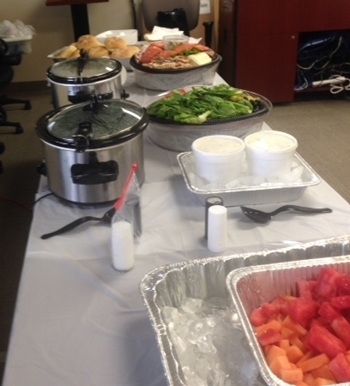 100% of funds raised directly benefit Walter Reed patients and their families through our luncheons. 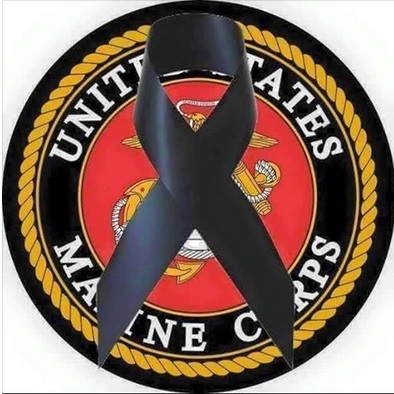 Marine Moms-Bethesda is not endorsed by or affiliated with the USMC, the DoD, or any other official agency.